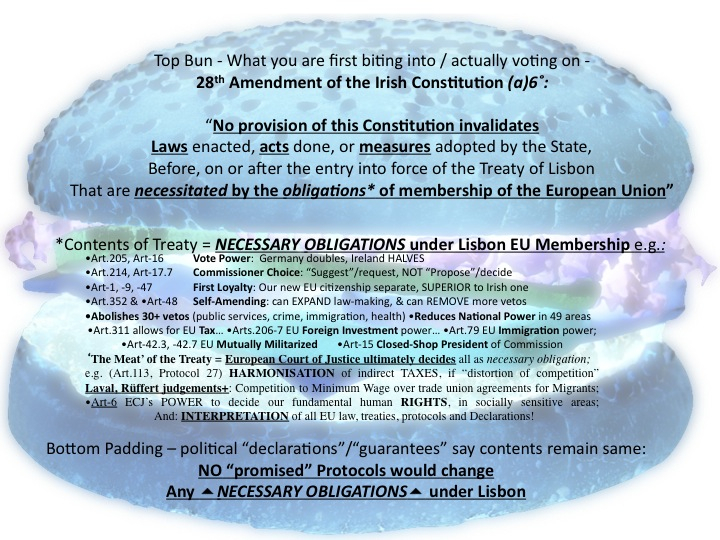 The Lisbon Treaty has been defeated [not been ratified] in the Irish referendum [0f 2008], and cannot be legally brought into being as a result. This is an ongoing matter of concern, as Irish and EU officials may attempt a “rerun” in the future. This sentence shows that the European Union which would be established by the Lisbon Treaty, although having the same name, is constitutionally and politically a different Union from that which we are currently members of, which was established by the 1993 Maastricht Treaty. Firstly, Lisbon would give the post-Lisbon Union full legal personality separate from and superior to its Member States, so that it could act as a State in the international community of States, sign Treaties with other States in all areas of its powers, have its own political President, Foreign Minister(High Representative), diplomatic service, embassies and Public Prosecutor, and make most of our laws. Secondly, Lisbon would abolish the European Community which we joined in 1973 and which still exists as part of the present EU, and replace it by the new Union (Art.1 TEU). I was in Ireland this weekend (18 April). Accidentally I met the Commission President José Manuel Barroso at the University of Cork. I had two other meetings. He made a splendid speech, particularly when he went outside his manuscript. This is positively wrong. The new Art.113 TFEU(Treaty on the Functioning of the EU) about taxes adds a new phrase of “and to avoid distortion of competition” as an amendment to the Article. This is a clear invitation to the European Court of Justice to outlaw the very distorting low Irish rate. Today the EU is only competent to harmonise tax laws under Article 113 if it is “necessary to ensure the establishment of the internal market”. With this Lisbon Treaty amendment the EU can also harmonise tax laws if competition is distorted – this is a much wider concept. When is competition not distorted by differences? So, if I was Irish and interested in the low corporate tax – which I am not – I would propose a strong Protocol to protect the low rate. It is not difficult to foresee an attack from another country – or company. The French Presidency has already signalled its plans for taxation before they enter into office 1 July. The Irish Government has criticized the French intentions. Well, the tax issue is also included in the annual work program for Barroso’s European Commission for 2008! “Work will also be continued in order to allow companies to choose an EU-wide tax base as set out in the 2008 Annual Policy Strategy. An impact assessment has been launched to examine the options and their implications”, it is said at page 7 of the Work Programme. The Commission will only publish their proposal – after the Irish referendum. All controversial proposals are delayed before referendums. This is normal practice for the Commission. It is only un-normal that the method has been leaked to the press with the publication of a private e-mail from a British diplomat referring to information received from the Irish Government in confidence.